I cooked them in an electric frying pan at 300F (easier I think than on the stove). The rings are sprayed with oil and semolina flour is added. Six minutes per side with the lid on. Split (King Arthur Flour's recipe). Both had good hole structure and tasted fine. Alton Brown's recipe is more like the commerical product sold here and used by McDonalds. Enjoy your breakfast. 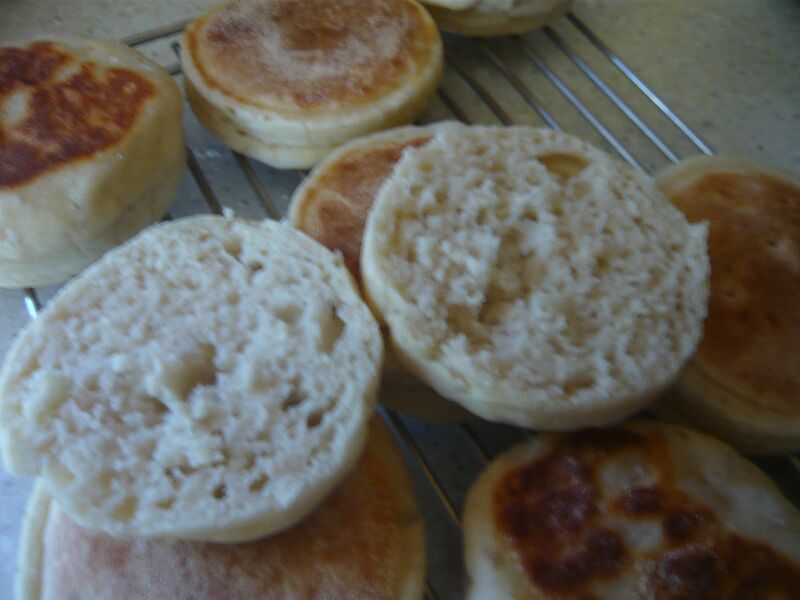 NCPaul - they look more like Muffins than Crumpets - and bloomin' good ones at that. NCPaul, they look bloody lovely. Just had a look at these recipe's & on the Alton Brown one it asks for "1 tablespoon shortening" I would assume this is fat of some sort, can someone enlighten me please. When a recipe calls for 'shortening' it means to add the fat of your choice, usually either lard or butter. The reason for this is that shortening helps yeast-based products to stay fresh for longer and it can improve the texture. I always add a knob of lard to my dough whenever I bake bread. corromant wrote: Just had a look at these recipe's & on the Alton Brown one it asks for "1 tablespoon shortening" I would assume this is fat of some sort, can someone enlighten me please. Shortening is the vegetable version of lard. Crisco is the most popular brand in the US. I think Trex would be a good option in the UK as a substitute, but lard would probably do. They look good, I am in the middle of trying my first batch of Wheels soft rolls, might have to give these a go too.